I always use the mental measure, "how much would this cost me if I bought it on eBay?". If I can get it cheaper online, I'll ALWAYS pass, unless the example sitting in-front of me at the flea market is in great shape. This is what I found from 2 sellers yesterday including the price paid. I gave them all a quick going over before I flopped down my $$$. The Miranda & Olympus were in a bit of rough shape, but I took a flier since they were only $1 each. The Leica didn't fire at the booth, but I figured that was a battery thing. The Polaroid looked clean (I have lots of experience buying these), and the Minolta looked clean but the film advance was stuck. After getting home and giving them a good going over, the Polaroid & Leica appear to be good to go. The Leica fired up easily with a new battery, and the Polaroid worked with a test cartridge. The Olympus appears to be a goner even if I give it a good cleaning. But again, only $1. The Miranda's shutter seems to be stuck, but I'm going to self CLA it to see if I can get it moving. The Minolta's film advance lever if frozen, so I'm going to try to fix it myself. If I fail on the Minolta, no major dramas because the lens is in good shape and I can use it on other cameras. So for $28 I got 2 cameras I can use. 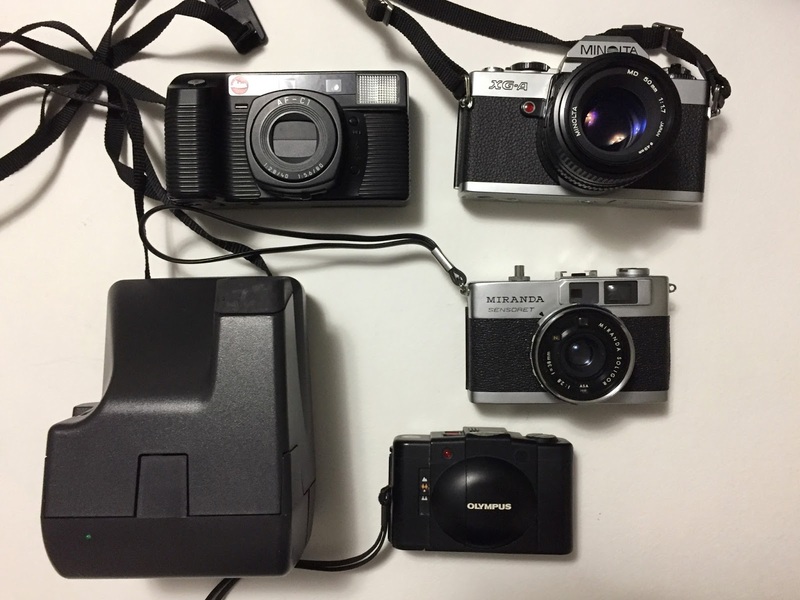 I particularly like the Leica and would have easily paid $25 for it alone. I might be able to salvage the Miranda, but I'm not going to put tons of effort into it. Bottomline, I got to hang out with the Mrs and go on this film camera treasure hunt. A fun couple of hours. It's heinous, but I don't like my XA2 - it's not very fun to use. Very sharp photos though.